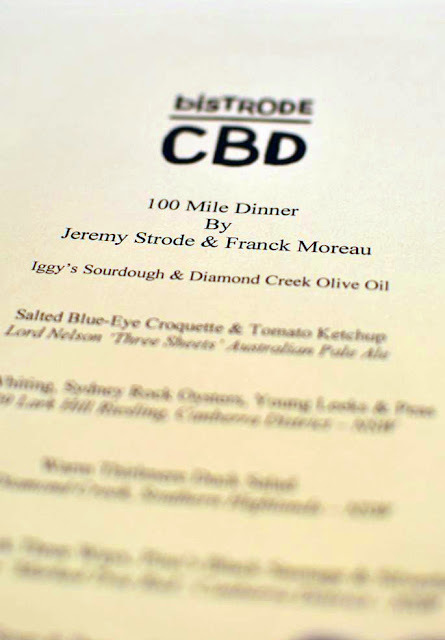 I have been curious about the recently opened Bistrode CBD, a new restaurant by the Merivale Group , occupying the space of what used to be Bistro CBD. When I, life is 2 mu(n)ch and her mom were in the elevator on our way up, she asked "Do you think Howard would still be here ?". As we stepped into the restaurant, I spotted Howard manning the floor. I wasn't too sure if he would still be there since there is a new chef in the kitchen, Jeremy Strode from the acclaimed restaurant Bistrode in Surry Hills. Chef Jeremy Strode is well known for his interpretation of modern British cuisine, I'm excited to see what we will have tonight. 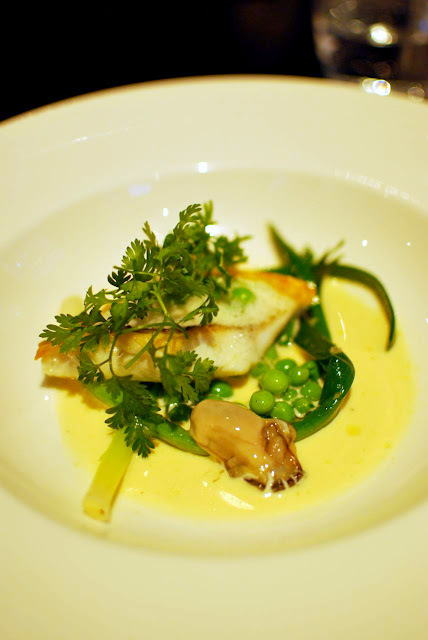 Tonight's special dinner was a collaboration between Jeremy Strode and the Merivale Group's sommelier, Franck Moreau. Unfortunately none of us were having alcohol with our meal tonight, so we missed out on the sommelier's wine / beer pairing with each course. All of the ingredients used in the 5 course dinner is sourced locally within 100 mile, hence the name of the event. 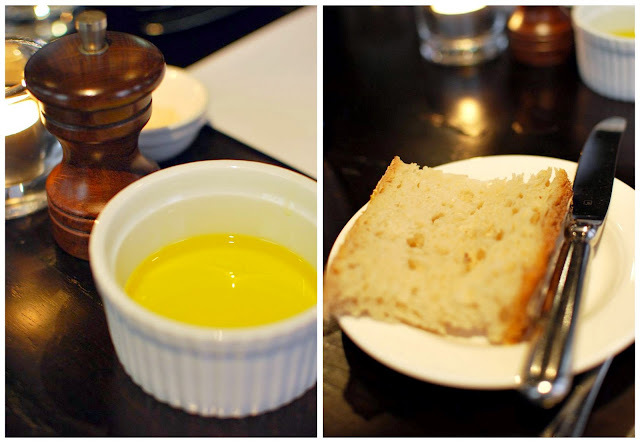 To start off the 100 mile dinner, we had Iggy's sourdough and the golden Diamond Creek Olive Oil. The extra virgin olive oil had this intense yet pleasant green olive taste and perfect for dipping the sourdough into. The golden croquette arrived piping hot with very creamy innards, very salty if eaten on its own, but paired with the sweet tomato ketchup and peppery rocket you get the right balance of the flavours. The sand whiting was done very well, the flesh was velvety while crisp on the outside. The Sydney Rock oysters we found to be very salty and we just couldn't figure out why as it was fresh oysters, not those pickled in brine (at least we don't think it is). The young leeks were tender and the peas were bursting with sweetness. The accompanying buttery white wine vinegar sauce complemented the whole dish. When the plate arrived, all you see is green - where are the ducks ? Move aside some leaves and the warm duck pieces were unravelled ! It was not until I start eating the dish that I realized there were many different part of the duck was used in this salad. There were shredded thigh meat, crispy duck skin, smoked duck breast and the unusual duck gizzards ! I'm not a big fan of offal so I was very surprised that I liked the gizzard, it was quite tender and have quite rich flavour. 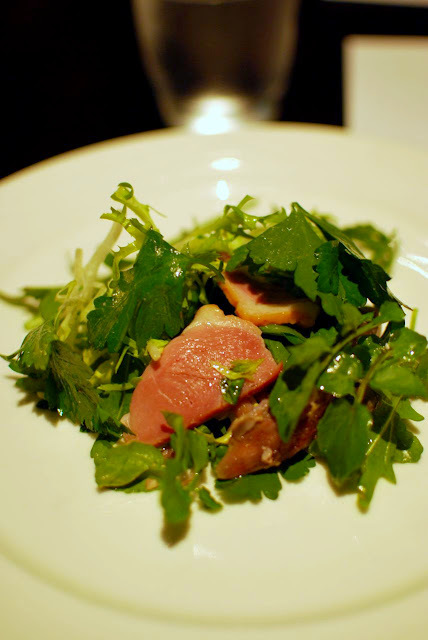 The salad just had the right balance of something rich as the duck and the freshness of the salad. 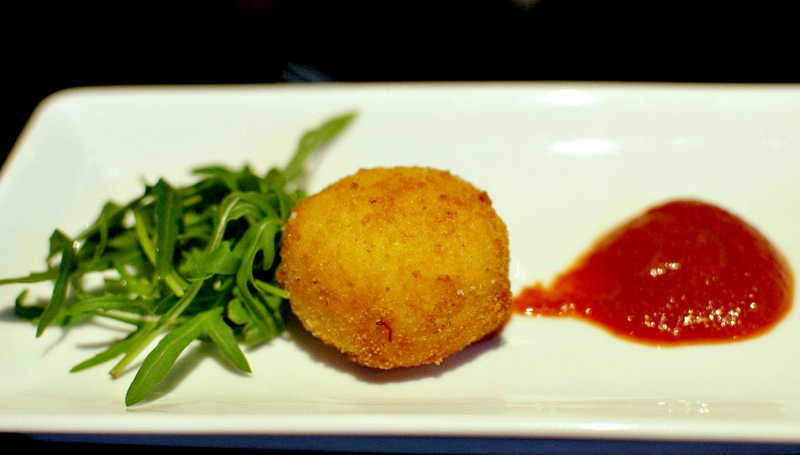 Try to focus on the photo....don't you think the plating of the dish resembles a love heart ? 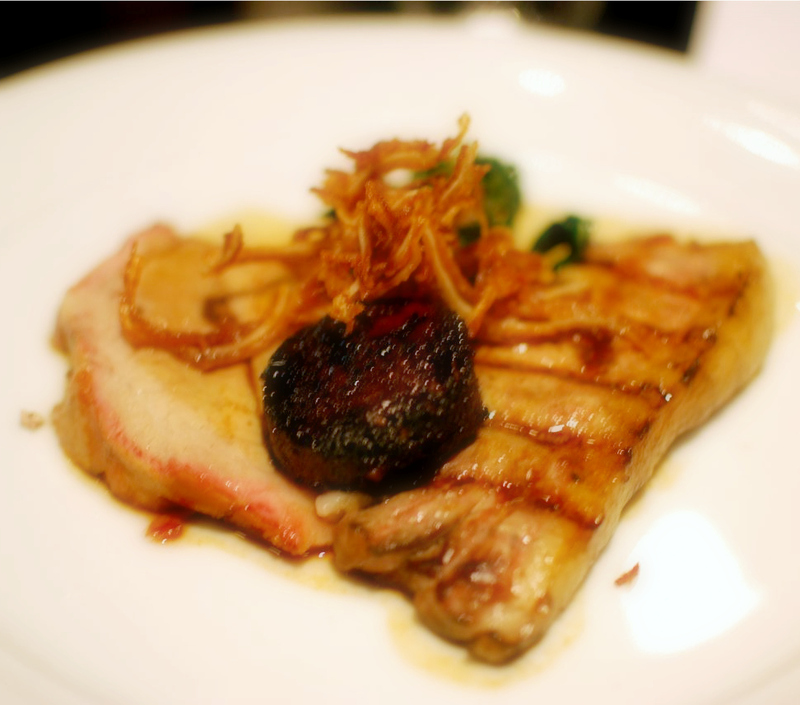 The Melanda Park pork was served three ways in form of grilled pork loin, roasted pork shoulder and deep fried pig ears. 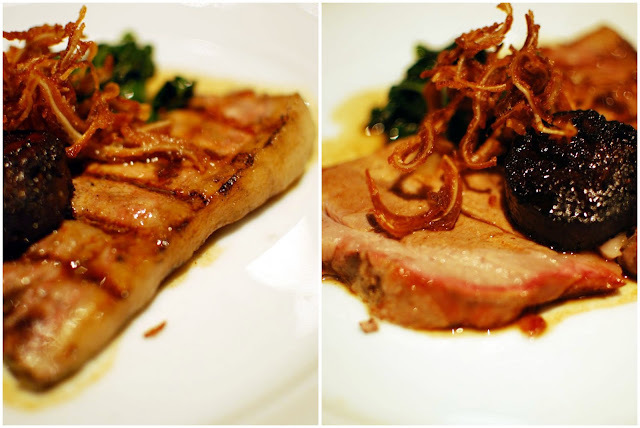 The grilled pork loin was very juice and tender, although we cut off what some might think is the best part of the dish, the thick layer of pork fat on the side. The roasted shoulder was tender as well and served with some pork jus. 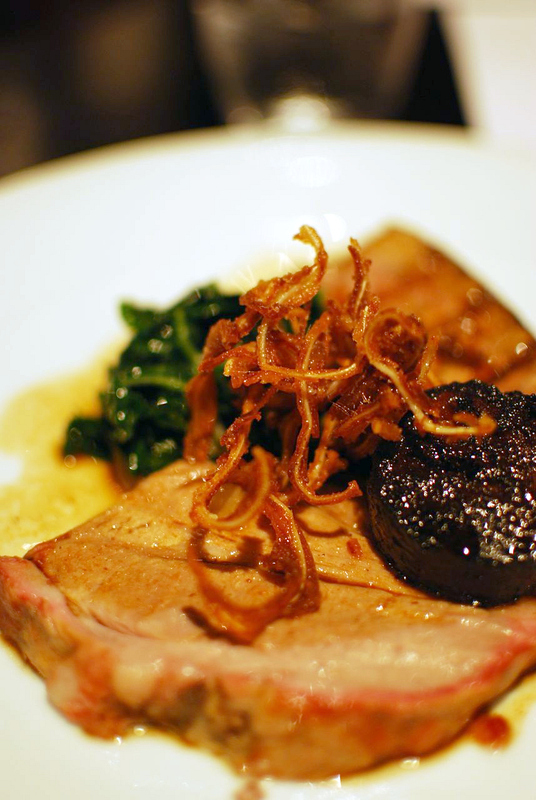 The best part of this dish would have to be the crispy fried, thinly sliced pig's ear. Pino's black sausage is quite different as they have mixed plump muscatel grapes in the sausage, so you get a lovely burst of sweetness from it amongst the strong spices aroma. People says not to judge a book by it's cover, it can't get more accurate than that with the last dish for the night. 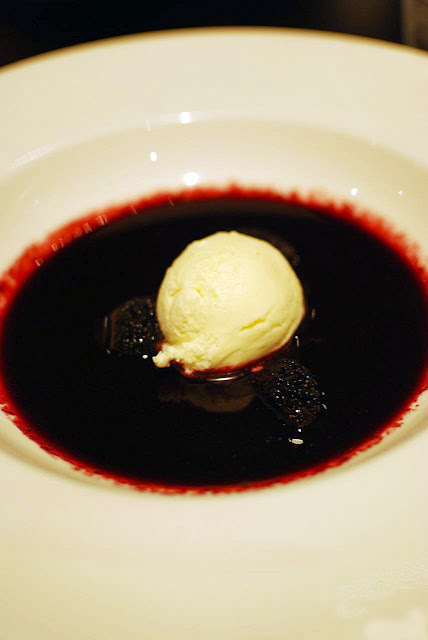 It looked very simple, a scoop of white sorbet in a pool of deep purple mulberry soup but the taste took me by surprise, it was ah-ma-zing !! The mulberry soup was sweet but still have the slight tartness of the berry and very refreshing. Partnered with a creamy mascarpone sorbet, it was a match made in heaven. It was great to see that we don't have to travel too far to find fresh produce with high quality as Jeremy Strode has shown us tonight. The foods did take a while to come out between courses as they seemed to be trying to serve the dishes to all tables at more or less the same time. I've been into the kitchen before and it was tiny :) The kitchen would have been running at full capacity on a special night like this. 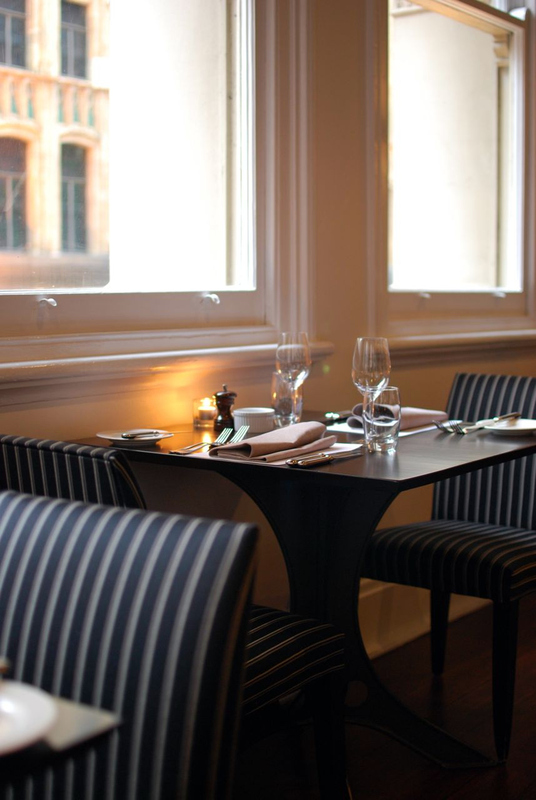 $90pp for 5 course meals , $145pp with matching wine/beer.